The information presented on this page was originally released on January 19, 2006. It may not be outdated, but please search our site for more current information. If you plan to quote or reference this information in a publication, please check with the Extension specialist or author before proceeding. 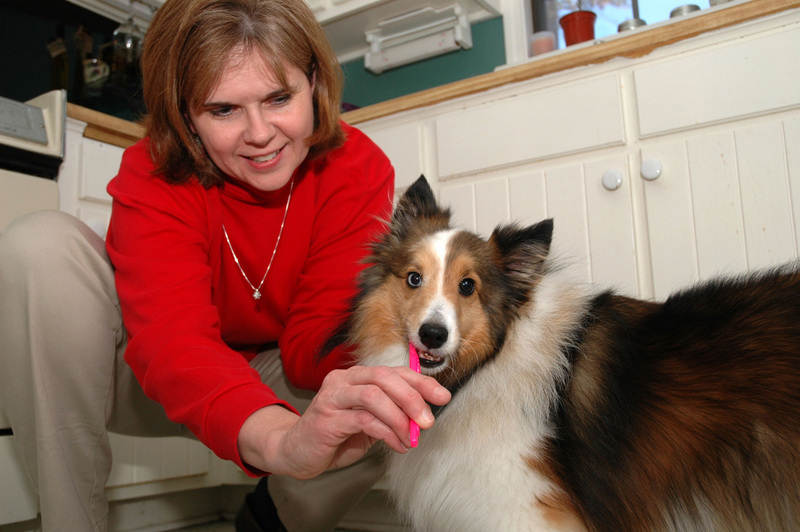 MISSISSIPPI STATE -- Brushing a dog's teeth is something most people think is not necessary or even silly, but Susan Seal has good reason to be aware of her pet's dental health. Sadie, Seal's 2-year-old Shetland sheep dog, is benefiting from those childhood memories. The Starkville resident brushes Sadie's teeth two or three times a week. Dogs, cats and other pets can have the same dental problems as people, said Dr. Diana Eubanks at Mississippi State University's College of Veterinary Medicine. Left untreated, gum disease in dogs and other pets can lead to heart disease, kidney disease and other health problems. Some routine care, Eubanks said, can save a pet owner money in the long run and their pet unnecessary pain. Many people consider rawhide chews and hard dog food all the dental care their dogs need. In fact, dental care is the fastest growing specialty in veterinary medicine, and MSU's College of Veterinary Medicine is one of the few schools in the South providing significant hands-on experience in the field. Dr. Bill Nalley is a graduate of MSU's College of Veterinary Medicine practicing veterinary dentistry in Long Beach. Dogs and cats, he said, are not supposed to have bad breath, which is one of a number of signs of periodontal disease. “My clinical experience has shown me that many dogs and cats suffering from advanced periodontal disease also will appear lethargic, not respond eagerly to play, seem depressed, not eat well, and may have symptoms of heart, liver or kidney disease,” Nalley said. Part of the treatment for gum disease is a prophylaxis, a procedure to remove plaque and clean the teeth. “Clients often call me two weeks after a prophylaxis and are jubilant that their pet is acting like a 2-year-old again,” he said. Nalley agreed that brushing their teeth is an important part of keeping a pet in top physical shape.